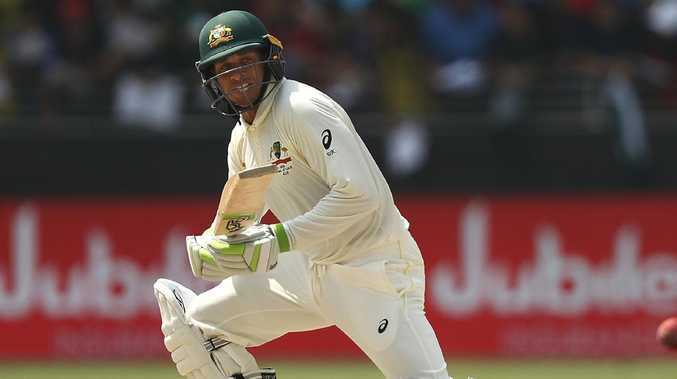 USMAN Khawaja has steered Australia to lunch on day two with a patient knock as the hosts eat into India's first innings total of 250. But Australia have already lost both openers, with Aaron Finch castled by Ishant Sharma for a three-ball duck before debutant Marcus Harris fell to Ravi Ashwin for 26 in a fine first-up showing. It left Khawaja to carry the can, and he is unbeaten on 21 with Shaun Marsh on 1 and Australia 2-57 at lunch. India's innings lasted just one ball into Friday, with Josh Hazlewood knocking over Mohammed Shami straight away. Australia's innings got off to the wort possible start with Finch sensationally knocked over by Sharma with just the third delivery of Australia's innings. After nervously leaving his second ball, Finch tried to drive a delivery that cut back into the right-hander, collected an inside edge and smashed into Finch's castle. Two stumps went flying out of the ground to add insult to injury for Finch, who fell for a three-ball duck. Only his leg stump was left standing. Aaron Finch is bowled for a duck. "Stumps everywhere. 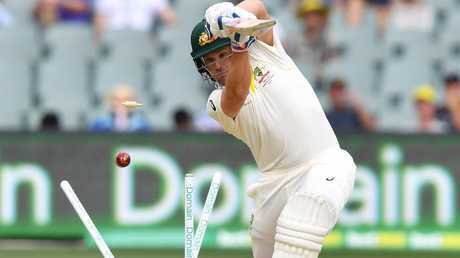 Aaron Finch gone for a duck, it's a disastrous start for Australia," cricket commentator Gerard Whateley said. "That is a rude start for the hosts."